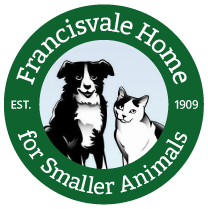 Dora came to Francisvale by way of two good Samaritans that chose to help with a hoarding situation near their home. Dora is timid at first but warms right up and enjoys being brushed and playing. She would do best in a quiet home with other cats. *Dora has lived with other cats. This entry was posted on Wednesday, October 31st, 2018 at 1:04 pm	and is filed under Cat.